Description: 180g audiophile vinyl - 2 LP set! 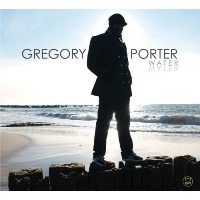 Gregory Porter's GRAMMY-nominated debut album! "This recording from jazz vocalist Gregory Porter, produced by Kamau Kenyatta, is billed as a program of songs based on themes of love and protest. Whether pining, yearning, or speaking out against injustice, Porter's voice is clearly understood in his attempt to tell you how he feels emotionally. While stylistically similar to the late Gregory Hines, Porter phrases like Stevie Wonder and enunciates the lyrics similar to Kurt Elling, while also incorporating techniques of singers like Jimmy Witherspoon and Joe Williams. Porter wrote most of the material, but also borrows from the show tune legacy, or modernists like Wayne Shorter. Many of these tracks feature him only with pianist Chip Crawford in preludes or complete duets, and they are introspective, as you might expect. Then there's the ode to riot-stricken Detroit "1960 What?," a powerful and deep piece that reminds the world what happened to the once industrial capital of the world. In hard bop trim, Shorter's "Black Nile" (featuring the legendary James Spaulding as guest alto saxophonist) has Porter shouting out a lyric line that was done many years ago by Chicago's Luba Raashiek, but Porter's voice is strained and breaks up. While on every track Porter sings with great conviction, he's more effective on lower-key compositions like the cascading title track, comping with a small horn section, or in sentimental repast for the modal, loping tale of complete heartbreak, "Pretty." His all-solo-vocal take on "Feeling Good" is an absolute showstopper of personalized soul. Without conceding that love is nothing more than an illusion, Gregory Porter plays the part of the dulled but still hopeful romantic to the hilt. As an impressive, substantive vocalist, he will have much more to say during future anticipated projects. He's right up there with Jose James as the next big male vocal jazz star." Recorded August 19 and 20, 2009. This vinyl edition released by Motema Music in 2013.